Reggie Barlow will be at Virginia State for years to come after signing extension. It turns out Reggie Barlow has a new deal after all, but it means he’ll be staying put. Virginia State has signed Barlow to an extension through the 2021 season, the school announced on Thursday afternoon. “What a great day!” Barlow said in a statement. “Thanks to Dr. Abdullah, Mr. Harris and our Director of Athletics Mrs. Peggy Davis! This new contract is a product of hard work and hard work by our assistant coaches. I’m so honored to have a great staff. The former NFL receiver was thought to be in the running for a job with the Oakland Raiders last month, but that never happened and so he’s staying put in Ettrick, Va.
Barlow led VSU to a perfect 9-0 regular season before winning the CIAA title game in 2017 and leading his team to its second-ever NCAA playoff appearance. 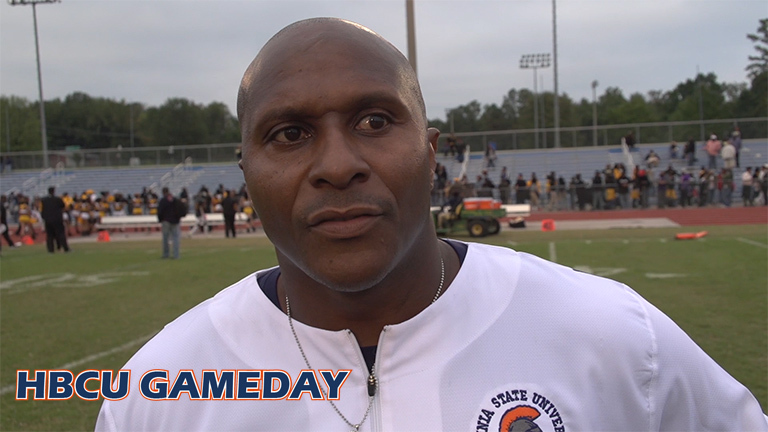 Barlow has compiled a 19-3 record during his two seasons at VSU after starting his coaching career at his alma mater back in 2007.